Once upon a time in the 19th century, the ideas of the French Revolution finally arrived in Austria and were gratefully received by an emerging middle class and urban intellectuals, students and nationalists. In 1848 (more than half a century after France), they attempted a revolution - for details, please see the relevant parts of my articles on the history of Austria. After the (mostly failed) revolution, Austria had a constitution, but also a new Emperor who was even more of a reactionary than the previous one - Franz Joseph I. In order to prevent revolutionary events such as those of 1848, he built a circle of army barracks around Vienna: The Rossauer Kaserne for cavalry, the Arsenal for artillery and the Stiftskaserne for infantry. These three facilities embraced Vienna and allowed total control of its inhabitants. Three cheers to the Emperor for that…The Stiftskaserne is the only one of these three buildings that is still exclusively used by the military. It can be easily spotted from the Mariahilferstraße: The Baroque spire of the Stiftskirche Church is a good landmark and indicates the mighty building, which borders almost directly to the Museumsquartier. The history of the Stiftskaserne dates back much further than into the 19th century. In the early 17th century, the high civil servant Johann Konrad Richthausen, Knight of Chaos (sounds funny in German, too) left his properties for the foundation of an orphanage. Land was bought in the Kärntnerstraße for the main building and another piece in the suburb of Laimgrube for a summer home. In 1679, the summer building was extended to a proper wing and in 1681, the attached land was walled. When the Turkish army advanced on Vienna during the Second Turkish Siege of Vienna in 1683, they devastated the property. But only four years later, it was rebuilt and the orphanage moved back in. In 1693, it was even extended and modernised, so that three years later, the orphans moved in permanently. By then, the building even had its own hospital-like facility. Another modernisation followed in 1732. This was only three years before a major turning point in the history of the Stiftskaserne-property came: When another civil servant named Georg Franz of Griener left 20.000 gulden coins for a foundation that should educate young men in warfare and engineering. In collaboration with the Chaos′ Orphanage, a school of engineering was founded at the site of today′s Stiftskaserne. 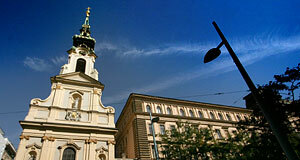 This was also when the first Stiftskirche was built, starting in 1739. Another turning point came in 1746: The constant warfare of the Habsburg Empire generated a need for bigger and better training facilities for military officers. The Duchess Maria Theresia of Savoy-Carignan founded the Savoyische Adelige Akademie ("Savoy Noble Academy") and purchased a stretch of land from the Chaos′ Orphanage, where she built the so-called "Academy Wing". In addition, a riding school was built near today′s Siebensterngasse. The academy was opened in 1749 - a few years later, it became subject of the Empress and in 1776, it was merged with the Theresianischen Akademie (named after Empress Maria Theresia, not the previously mentioned Duchess). This academy still exists in Wiener Neustadt - it is "the" Austrian military academy, sort of a poor man′s Westpoint. Continue with "Stiftskaserne Vienna - Part II"